However, whole house back up may not be necessary if creature comforts are less important to you than vital electrical loads such as refrigerators, freezers, water pump, security lighting, garage door openers, and things like that. A smaller (i.e. less expensive) generator can accomplish those goals for roughly 2/3 to 1/2 the price of the whole house system. Ironically, the electrical installation is much more involved though. Instead of installing a transfer switch between the utility power source, and the generator power source, an extra electrical panel is required to hold the vital electrical loads mentioned above. Those emergency loads are re-wired into the new EM (as in emergency) panel also called a generator panel which is connected to the generator. A transfer switch is then installed between the main electrical panel (which contains the non-essential loads), and the EM panel. The transfer switch can be automatic, meaning it senses the utility power and switches automatically when utility power is lost, or it can be a manual transfer switch which, as the name implies, is switched over by hand. 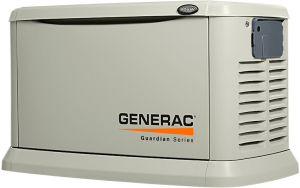 Generac generators is one of the top manufacturers in the country. There is allot more information at Generac’s website, here. Kohler generators is another well known manufacturer, mostly for commercial and industrial applications. You can get more information at Kohler’s website, here. Well, hope that helps a little. 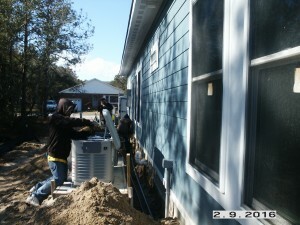 His & Her Electric, LLC is very experienced at installing these generators, in any configuration. So if you’re interested, contact us and we can go over the details. Jeannie preparing a 20 Kw, whole house generator for hook up. 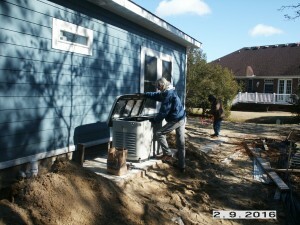 Josh working on installing a new, 20 Kw, whole house generator.